Hi guys, it's Angie again. Well, the County Seat's opening night was amazing. And since that time, Felicia tells me we've been fully booked every night. Of course, we're still only open on weekends, but I hope to change that soon. I want to make sure the people who work for me get as close to full time as possible, if they want the hours. With Hope still in school, I think she's working too many hours as it is. But of course, that's not my call. And it's still summer. Estebe is taking off soon to run the kitchen for his community's annual festival. It's a pretty big thing. Of course, all festivals here in the Treasure Valley are a pretty big thing. Eagle has a weekend celebrating the Rocky Mountain Oyster. That's one item you'll never see on the County Seat's menu. Estebe says he wants me to meet someone before he goes. I've been trying to expand my contacts in the farming community in case we need a new supplier in a hurry. Ian's been busy helping Mildred figure out how to run a goat dairy. And Erica and Mrs. Potter haven't been around much lately. I'm going to have to take them a loaf of homemade bread and strawberry jam and get the gossip. I've got to go, it's feeding time here at the farm. I can hear Precious getting restless on the baby monitor and Mabel is standing at the doorway of the barn, watching the house. Don't tell me animals can't tell time. Of course, Dom is at the door. He knows what we need to do as well. Hope you stop in at the County Seat next time you're in River Vista. We have a fun summer menu that includes childhood treats, just not Nona's fried green tomatoes. At least, not yet. KILLER GREEN TOMATOES releases tomorrow, July 3rd. To Angie, nothing tastes more like summer than her Nona's fried green tomatoes. Eager to add the recipe to the menu at the County Seat, she's found the perfect produce supplier—her sous chef Estebe’s cousin, Javier. Just one problem: ladies’ man Javier’s current hot tomato Heather has turned up dead, and he’s the prime suspect. 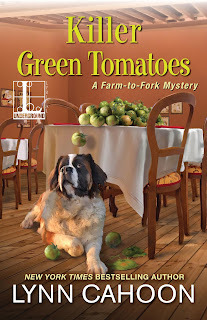 Somehow, between managing her restaurant and navigating a romantic triangle between Estebe and Ian, the owner/manager of the farmer's market, Angie needs to produce evidence to clear Javier—before this green tomato farmer gets fried . . .Lynn Cahoon is the author of the NYT and USA Today best-selling Tourist Trap cozy mystery series. GUIDEBOOK TO MURDER, book 1 of the series, won the Reader's Crown for Mystery Fiction. She also pens the Cat Latimer series available in mass market paperback with SLAY IN CHARACTER coming in late 2018. 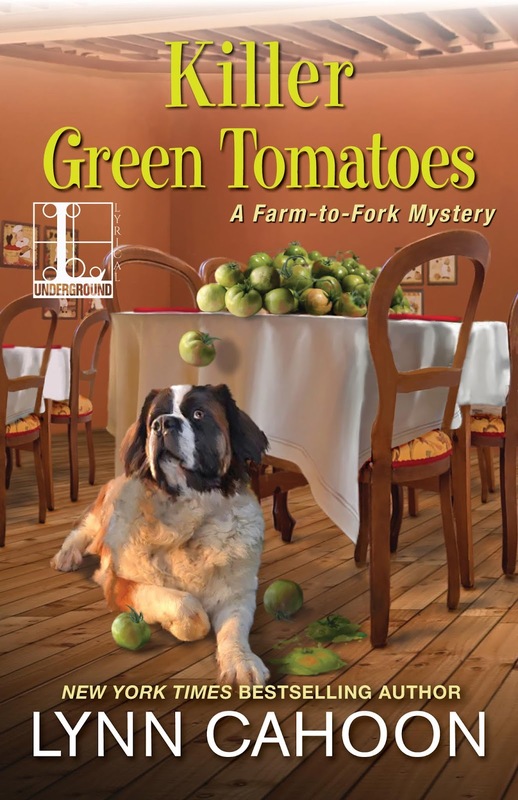 In addition to releasing WHO MOVED MY GOAT CHEESE in March as part of the new Farm to Fork series, KILLER GREEN TOMATOES released July 3rd, 2018. Such a great new series! Happy (almost) release day, Lynn! Love the cover! Love green tomatoes! Love cozy mysteries! Can't wait for the opportunity to read this book. Precious is adorable. I can't imagine owning a baby goat. Love the cover and this sounds great!! Cant wait for my copy to get here. My mother always says that by the way, lol. Love the series and especially this cover! Okay,so the postings being weird. Big thanks to Kay B, Eileen, and Jana for commenting since it won't let me post invididual responses now. I've cleaned house for most of the morning. Now it's time to get some words in. Happy Fourth!